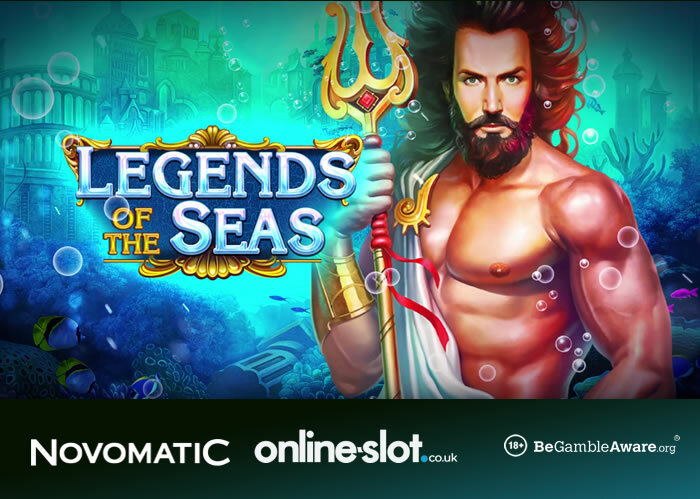 Novomatic has released the Legends of the Seas slot – join Neptune, the supreme ruler of the seas, with random symbols, wild reels and free spins with multipliers up to 10x. Legends of the Seas comes with 5 reels and 40 paylines – as you’d expect, you can play from just 40p per spin on all devices of course. Visually superb like all newer Novomatic titles, you’ll see Neptune to the left-hand side of the reel set. Symbols on the reels include majestic creatures like sea horses, turtles and dolphins. You also see enchanting mermaid and Neptune on the reels. In the base game, you can randomly benefit from the Neptune feature where a symbol is chosen – up to 9 adjacent positions will be occupied by this chosen symbol for higher chances of winning. Now, look out for both Neptune and the mermaid appearing fully on their reels, you’ll enter the Free Games feature. You will begin with 10 free spins with 1 of 3 features applying on each of them – up to 9 positions can be taken up by the same randomly chosen symbol or 1 of the reels becoming a wild reel. The other option is the Neptune/mermaid symbol taking over reel 3 for additional free spins. With regards to the cash spins, they are free spins with no wagering requirements – what you win is yours to keep (i.e. cash).